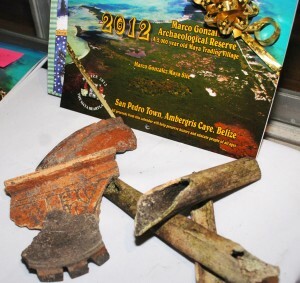 For years the residents of San Pedro have known about the Marco Gonzalez Mayan site located deep within the jungle forest at the southern end of Ambergris Caye, but it was regarded more as an area to pilfer artifacts from rather than as a historical site worthy of preserving. This began to change when in the late 80s and early 90s, Drs. David Pendergast and Elizabeth Graham began to study the area. Their exploration pointed to links between the Post Classic occupation at Marco Gonzalez and the Lamanai site located on the mainland some 113 miles away by river and sea. 1986 excavations of this 2,000 year old site provided solid documentation of those links, and also enabled them to delineate some aspects of both earlier and later use of the Caye’s site. Of the 19 recognized sites on Ambergris Caye, no dedicated attempts had been made to preserve any of them. This all changed when in 2007 talks of Marco Gonzalez site being surrounded by a new large community/resort development prompted action by a small group in San Pedro led by Jan Brown to petition the Government of Belize and Institute of Archaeology to raise the site’s status from “recognized” to “Reserve”. As a result, in August 2010 Marco Gonzalez Maya Site was officially put in “Maya Site Reserve Status”, which in itself is historic as the first Reserve Status of a Mayan site on a Belizean island. Current day Marco Gonzalez is approximately 8 acres on a small area of elevated terrain. Over 2,000 years ago, the area would have been much larger as evidenced by archaeological debris underlying mangrove stands. Before sea levels rose, the area is thought to have had beaches and a direct access to the sea. The rise in sea level of about two feet over the past 20 centuries, plus accretion of weather environs has significantly altered the land mass. With donations from individuals, granting agencies and fund raising the restoration of the Marco Gonzalez site has been a labour of love for Project Director Jan Brown. With a need to replace the makeshift “London Bridge” that is currently constructed above the swampy path leading into the site, the Board of Directors have just published a 2012 Marco Gonzalez Archaeological Reserve calendar to raise funds. The public was invited to the calendar launch/reception on Saturday, November 12th at the San Pedro Holiday Hotel. The beautiful calendar, adorned with pages of photos of the site, excavations, artefacts and information also incorporated local personalities depicting Mayan life within the site. Island icon Celi McCorkle, who posed as an elegant Mayan Queen, along with “Caco” Trejo who depicted a Mayan worker, and Jan Brown were at the reception personally autographing the calendars which were on sale for $20bz. In a presentation to the crowd of supporters, Brown informed that all proceeds from the sales of the calendar are earmarked for Project Boardwalk. “The approximate cost of building this new boardwalk is $500,000.” stated Brown. “We are committed to building the boardwalk while considering the sensitivity of the mangrove environment; thus the construction will be eco-conscious. Plans place the boardwalk three feet above the ground/water level and the structure must be secured to bedrock. The boardwalk will have to be weight-bearing for transport vehicles carrying building materials into the site for the future Visitor Center, continued excavations and shuttling visitors with limited physical abilities. Spanning eight feet in width, the boardwalk will also have two different viewing platforms along the way for birding, nature enjoyment and interpretive signage. 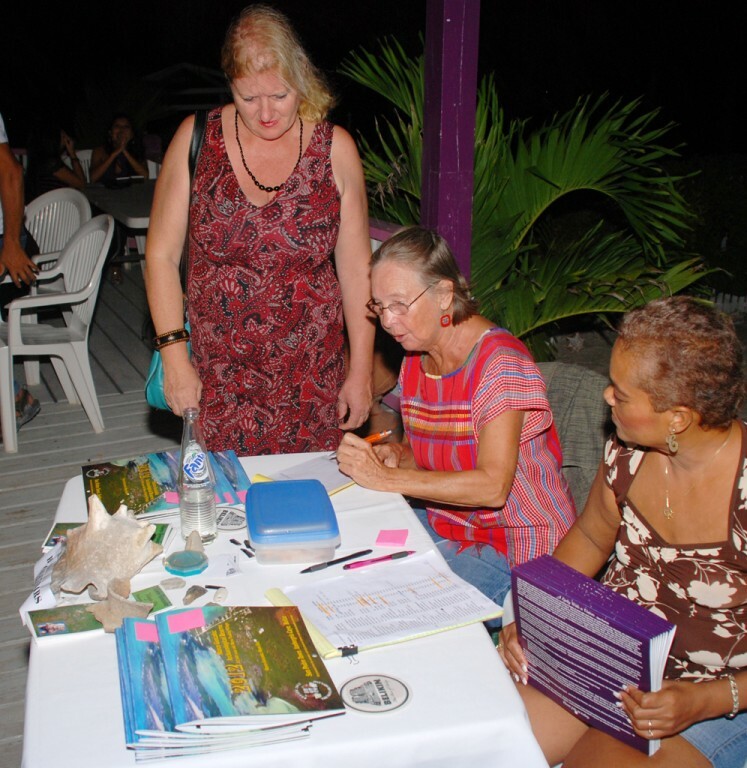 With a grant challenge from the Upton Foundation, monies have been matched by the Belize Tourism Board, the National Institution of Culture and History and the Institute of Archaeology, so we are pleased to have raised $40,000 so far. With over 70 advertisers contributing to the calendar, these monies have all but covered the cost of printing this calendar; therefore all proceeds from the sales will go to Project Boardwalk. We have 2,000 calendars to sell and our projected goal is to raise just under $40,000.” In closing Brown graciously thanked the community for their overwhelming support, “With the help and support of our community and beyond, we are making this dream a reality; one that is good for the all. From island visitors to our resident children who will have the opportunity to learn about their Mayan heritage, this project benefits our community”. Calendars are available at Holiday Hotel, Coral Cable Vision, George’s Kitchen, Lone Star Bar & Grille, Caye International Bank, Coco Loco’s, and Roadkill Bar as well as from the Board of Directors. They can also be ordered through the Marco Gonzalez website at http://www.marcogonzalezmayasite.com. For more information please contact Jan Brown at 662-2725. Belize 2012: The Countdown Has Begun!